I processed the contact logs, rather than just the hop logs, and after ~6 hours it completed! Now all contacts in the whole MIT dataset have associated cell towers. If a cell tower could not be found for the contact duration, then a second search was done for a record of a cell tower finishing in the previous hour. The timestamps are preserved so that they can be excluded later. The following shows the stats for this data, in regards to cell towers. This means that out of 114046 contacts between 01 Jan 2004 and 05 May 2005, only 4045 nodes report at least one cell in common at time of contact, but 28804 report different cells, and a further 50655 report cells for at least one of the nodes. This means, that if we assume that a one sided cell sighting at time of contact determines a cell sighting for both nodes, then we have cell towers for ~73% of contacts. The assumption is that if any of the cell towers seen in the contact period, then the nodes are considered to share a cell. However, this can be further refined if needs be, to be more strict, where a contact period is very long. Below is a visualisation of the connected cell towers for MIT-Oct 2004, it it very confused and has a huge central mass, but there are clear connections of towers on the periphery. I think this can be further refined to be more strict about cell tower connections (as at the moment, the dataset contains more than 1 cell tower for any given contact period). Also, at the moment it links two cells even when two nodes are on contact for a long period of time, in which they could conceivably be moving together. Cell towers where an edge is made when either node in a contact event has seen one of the cell towers. Met with Pádraig and Davide, we need to get out of the data cleansing phase, and get into some more interesting areas! I need to generate the linked cell towers graph based on contacts not just message passing. (as this was what should have been done in the first place! ), and use the last known cell tower (within a time limit) as the current cell tower, if none has been seen. This will hopefully mean that we will have cell towers reported for all contacts, and with any luck there should be a larger proportion of contact events that report the same tower. Using the graph, link the main connected towers into the ranking algorithm. In the last meeting I had with Pádraig we went through the spectral clustering technique, and discovered that there were some errors in my calculations of the the clusters. I took the time to re-do the community calculations, and to run the tests again, to make sure all is correct. I used the MIT dataset, and constrained it to the month of October 2004 (as before). Messages are created and initially sent at the first time step. 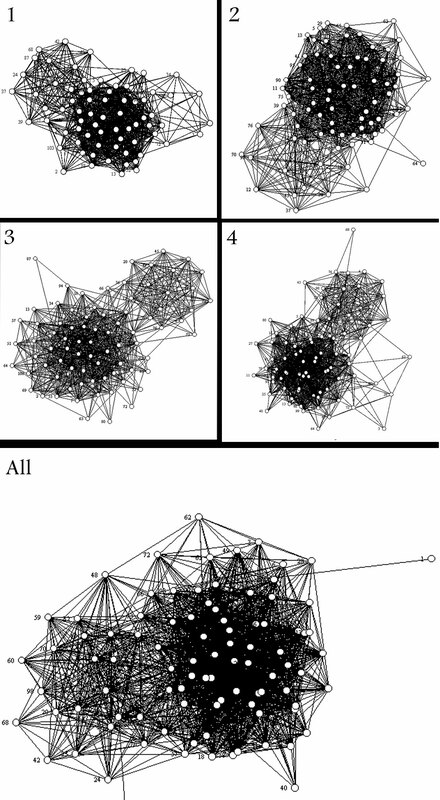 The selected communities for each week are taken as the biggest group, which in practice were roughly the same set of connected nodes. I chose to omit the nodes with a value of 0.0 in the matrix (V) (see data pipelines). This plot shows the delivery ratio over time for MIT-OCT dataset, for LBR communities (where the community is taken from weeks 1, 2, 3, 4 and all 4 weeks), PBR, Prophet, Unlimited Flood and Random(1.0, 0.2, 0.0). This chart shows delivery ratio and cost for each Protocol, note that unlimited flood does not report cost. In these updated plots, it is encouraging to see that with the corrected community structure, LBR actually performs well, and in fact for the community structure in week 1, it performs better overall than PBR, with weeks 2, 3, 4, all, close behind. It is also good to see that LBR is beating Random 0.0, and 0.2 consistently. LBR week 1 Community also tracks a small way behind Flooding for a short while around 05/10 – 08/10 which is quite interesting. The communities are listed below (or can be viewed here), for further analysis. Having given this a little more thought, this is a little mis-leading, so I have generated new plots where all Protocols are constrained to the same community nodes. 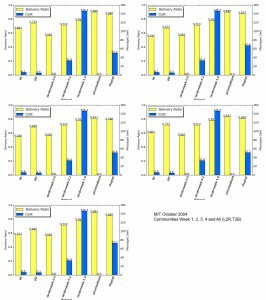 Unfortunately, this yields a similar spread of results between the protocols, as did the results that did not consider community structure. Only the structure discovered in week 1 increases the delivery ratio. What I plan to do now is to go back to the ranking algorithm, and use the linked cells mechanism to re-calculate the rankings. It might also be useful to start thinking about being able to use the real-time location information (in this case cell towers/linked cell towers) in a routing algorithm directly. This would let us start to implement some simplistic location predictions. I also created a clearer graph visualisation for the cell tower links, this shows that there is a componant that encompasses a large percentage of the reported cells overall. If we were to consider this one location, it is possible that it covers a very large area. This shows the cell towers that are connected when at least 100 messages are passed and reported at both cell towers, edges are numbered where this is more than 300. Using the log of hop events, I was able to generate a list of cell towers being used at the time of the hop, from this I built a list of the cell towers that are linked in this way, with a count of the number of times they had been connected (linked_cell list txt, or linked_cells json version ). From this a created a graph where the weight of the edges is the count. Edges with a weight (or number of times nodes passed a message and reported different cell towers) less than 100 are removed for clarity, the colour of the edges shows the weight of the edge increasing from blue to green. No self loops were discovered. No parallel edges were discovered. This network seems to be valued. This graph is not weakly connected. 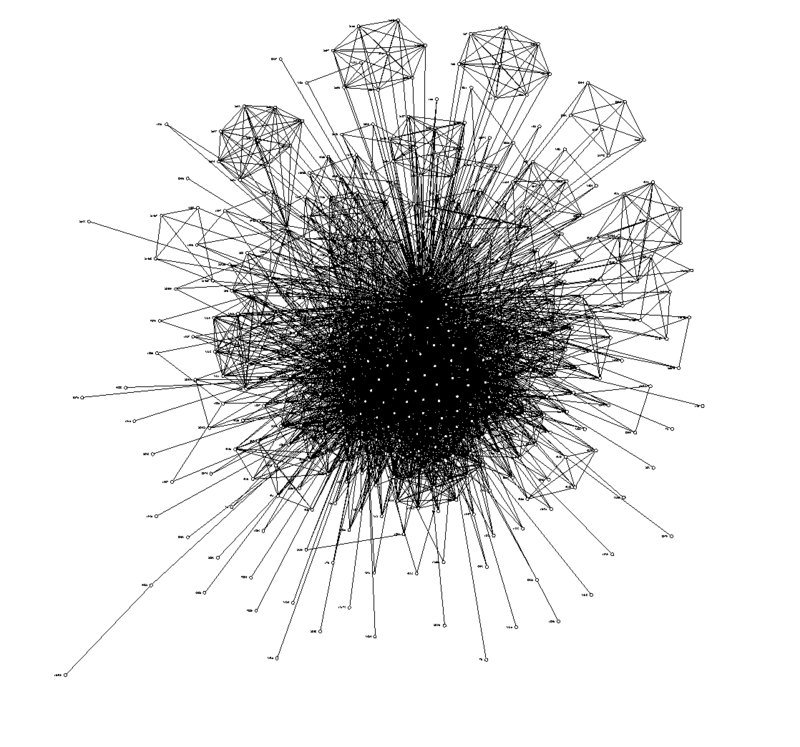 The largest connected component consists of 67 nodes. There are 61 strongly connected components. The largest strongly connected component consists of 24 nodes. Edges are coloured linearly from white to black depending on weight, edges with a weight greater than 300 are labelled. It seems that there are is a group of towers that are strongly connected, by large number of messages being passed, and nodes reporting them as being the cell towers used. One possible reason for this, is perhaps because the places where the nodes are, are popular, and as such, require more cell towers to cover the demand. These results are promising, because it means that if we pre-process the data, and ignore connections where there is a low weight, we can use groups of towers to give a notion of place. What this means is, when a node reports a tower in the known cluster of towers, we can assume that it is in roughly the same place as any other node who also reports a tower in the same cluster. I calculated the communities as described in data-pipelines and from this generated two lists of nodes for every week in October, and for all weeks. I took the largest list for each, and used that as the community for which to test the LBR algorithm. Updated plot, showing the delivery ratio for LBR-Community, one (dotted) line for the communities found in each week, and overall. 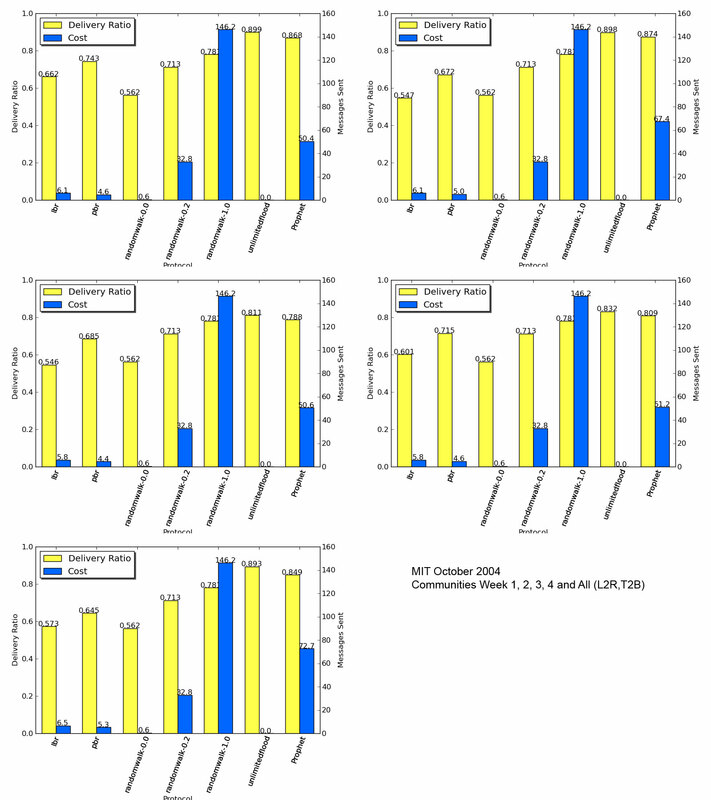 It seems that, as expected, routing within the community gives an advantage to the algorithm, and in fact, when the community knowledge is derived from the full dataset, then LBR performs better that the average of the rotated dataset. This plot is slightly misleading however, as the data for the previous algorithms is the rotated averages, whereas the data for LBR-Community is for straight runs. Below is the plot against straight runs of each other algorithm. This plot shows straight runs of all algorithms, and the updated LBR-Community runs. In this plot, it is obvious that the difference is less profound as with the average plots, however, I am considering running the rotation scheme again for LBR-Community. I wanted to see what the real picture was when using cell towers for location, so for a run of LBR on the MIT Dataset for October, I collected details about every message hop. I compared the timestamps for the hops to the cell tower information in the database, to find out which cell tower each node involved in the message hop was recorded as using. These results are slightly concerning, as roughly half of the hops between nodes happened when nodes reported different locations (cell towers ID), 10% of hops did not record any cell tower information at all, and in 42% of hops, only one node reported a location. This seems to demonstrate that we cannot rely on cell tower information to give us an accurate idea of the co-location of people. However, it might still prove useful to use the cell tower location for generating general mobility statistics, which could be used as routing metrics. Davide mentioned he had some ideas about these sort of statistics. I have visualised the graph of connections in the MIT Dataset, for the month of October split into 5 parts: Weeks 1 to 4, and the whole month. Each week represents a new set of edges, built after the end of the previous week. So each graph shows the edges that are formed only in that week. The list of edges and matrix data is in the zip file here: mit-graph.